Uthgerd the Unbroken is a Nord warrior who lives in Whiterun. Talking to her about her attitude will annoy her and result in an option to challenge her to a brawl for a 100 septim bet. She is available as either a follower or a wife once you have defeated her in hand-to-hand combat. She owns a house in town, but she spends all of her time sitting in the Bannered Mare, at times speaking to the flirtatious bard Mikael. She only ventures outside at the conclusion of the Companions quest Blood's Honor, when she will be in the crowd gathered in front of Jorrvaskr after the Silver Hand attack. She will always be in her house during and immediately after the Battle for Whiterun. She wears a set of steel plate armor, including matching boots and gauntlets. She carries a steel greatsword, a spare belted tunic, a key to her house, and a selection of common loot and gold. While she's sitting in her chair at the inn, Mikael will sometimes sit down next to her and they will chat, though he does not try to flirt with her as much as he does with other females that frequent the inn. Whenever you approach her, she will say, "Want to hear a little Nord wisdom? You don't really know a woman 'til you've had a strong drink and a fistfight with her." She may also remark, "Keep walkin', softgut. I'm more woman than you can handle." or "I got no quarrel with you, but I won't turn one down, neither." Stating that she must really love to fight will have her say "The heat of battle is the fire that forges the strongest blades. It's an old Nord proverb. That, and a true Nord never misses a chance to test her worth." You may also accept her challenge to fight her at any time. She will boast, "Think you can go blade to blade with me? You'd be dead in six seconds." At this point, you can ask her if she can beat you, to which she will reply: "And why not? I could beat anyone in this city, bare-handed. A hundred gold says I knock your hide to the ground." You can accept or walk away; if you decide to take her up on her challenge, she will be unafraid and say, "Just fists. No weapons, no magic... no crying. Let's go!" If you reply that you have better things to do she will bait you, "Pfft. Snowback. ", or if you don't actually have enough gold, she will laugh at you and remark, "Why don't you come back when you actually have a hundred gold?" When you have beaten her, she will be amazed and tell you, "Now that's what I call a punch. You got me." You can then tell her that you have earned your money, which will cause her to say, "You're no liar. Best fight I've had in years. There you are." She will then offer her support in battle and tell you: "You ever need another blade at your side, just ask. Wouldn't mind seeing how you handle a few trolls." She appears to be quite angry, and you can state that she appears to be holding a grudge, to which she replies, "You been talking to those Companions? "Too hot-headed," they cried. Weak, pathetic cowards, the lot of them!" Her grudge is with the Companions, who rejected her, and you can then ask her why: "It wasn't my fault! I told them over and over that it was an accident! They wanted me to prove my worth, so they threw me up against a young whelp of a lad, hardly old enough to grow his first chin-hairs. I guess they thought a woman wasn't strong enough to hurt him. I didn't mean for him to die! Why would I want that? I just... lost control." When exiting conversation with her, before you recruit her, she will say either "Yeah, whatever." or "Good. Chat time's over." Uthgerd is skilled in all physical combat techniques and will use any staves placed in her inventory. While she has some skill in light armor and two-handed weapons, she is more skilled in one-handed, blocking, and heavy armor. Her archery skill will eventually be better than her two-handed, but will lag behind one-handed. Uthgerd is in the CombatWarrior1H class, even though she is initially equipped with a two-handed weapon and her combat style is two-handed. 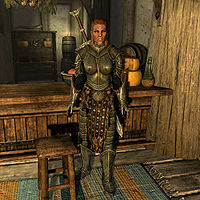 This issue has been addressed by version 1.2 of the Unofficial Skyrim Patch; it changes her class to CombatWarrior2H to match her weapon and combat style. Her home will be free to use as soon as you have defeated her in a brawl, providing one of the earliest usable homes that is not faction-related. It contains one bed and thirteen items of storage; only a few containers are safe for storage. The door lock always resets when you leave Whiterun, so you will need to take her key via inventory trading as a follower to avoid being caught lockpicking. If you marry her the only way to get the lover's comfort rest bonus is to have her move to your house. Uthgerd: "By Ysmir, it's true. A jester - funny suit and all. Just north, by the Loreius Farm. Fool had a coffin in a cart, with a broken wheel. Like to see him laugh his way out [sic] that." Skulvar: "Well, sounds like you've had quite the journey, Uthgerd. But you were gone longer than usual. I got to thinking maybe you weren't coming back..."
Uthgerd: "You sound like my ma. Figured I was lying dead in a field somewhere, is that it?". Skulvar: "Thought did cross my mind, yeah. War brewing, talk of a riot in Helgen, and now jesters? Skyrim's gone mad, girl. You need to be careful out there." Uthgerd: "Careful, huh? Thanks, Skulvar. I'll remember that. Ha ha ha ha ha ha!" When attempting to brawl and defeating her, she may not pay the wager and refuses to become a follower. The brawl dialogue still persists. Uthgerd may disappear while being used as a follower. This occurs at very inconsistent times. She does not die, does not return to Whiterun, and the game no longer thinks you have a follower. There is also a chance you are not going to be able to recruit another follower if she disappears, so make sure you save often if you want her as a follower. She may also at times fully reset back to Whiterun. She does not retain any items given to her. ? She may attack you for no apparent reason upon entering the Bannered Mare. If you are able to sneak and stay out of her sight until she stops pursuing you, she will no longer be hostile. This is due to her high aggression setting when you have committed zero-bounty crimes in Whiterun. Commit a minor crime in Whiterun in front of a guard and then clear your bounty using the usual methods. Select her in the console, use setAV Aggression 0, then disable her, and enable her again. This page was last modified on 22 November 2018, at 03:57.